and slows everything down. Packed with often-surprising discoveries, Twentysomething is a two-generation conversation that will become the definitive book on being young in our time. "The fullest guide through this territory . . . A densely researched report on the state of middleclass young people today, drawn from several data sources and fi­ltered through a comparative lens." Robin Marantz Henig is an author and journalist. She has written eight previous books and is a contributing writer to the New York Times Magazine. Her daughter, Samantha Henig, is a journalist in her mid-twenties. She is the web editor of the New York Times Magazine. They live in New York City. "The fullest guide through this territory...a densely researched report on the state of middle-class young people today." “In this provocative, comprehensive, and often very funny examination of the phenomenon of 'twentysomething,' Robin Marantz Henig and Samantha Henig provide the perspective of two generations on this new stage of life. 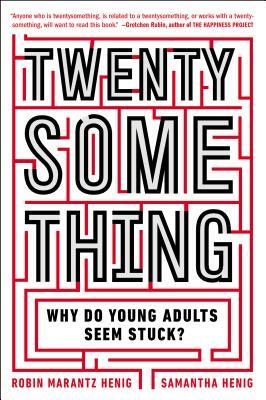 Anyone who is twentysomething, is related to a twentysomething, or works with a twentysomething, will want to read this book." “Mixing rigorous empirical evidence, testimony from twentysomethings themselves, and the astute observations of a mother and her twentysomething daughter, this insightful and engaging book shows us that sound bites and slogans are just not up to the task of capturing life as it being lived by young adults. Highly recommended!"